HELEN, Ga. – What has become one of the fun highlights of Oktoberfest as well as an important fundraiser for Family Promise will take place Saturday, on the Chattahoochee River. It’s the third annual Great Helen Duck Race. Family Promise of White and Helen will launch 2,000 little yellow rubber ducks into the ‘Hooch across from Paul’s Margarita Deck and watch them race to the finish line at the Helen Festhalle. The first duck to cross the finish line will win $1,000 cash for its sponsor. Family Promise is selling sponsorship for each and every duck in the race. To sponsor one duck is only $5 but a raft of five ducks can be sponsored for only $20. To purchase a sponsorship, call the Family Promise Day Center at (706) 865-7725. Tickets can also be purchased on-site in Helen until 4 p.m. the day of the race. The Great Helen Duck Race will kick off Family Promise Week (Oct. 21-28) and help spread community awareness of the crisis of family homelessness across northeast Georgia. Family Promise of White and Habersham was established in 2013 to assist families in our own community. Last year alone, Family Promise of White and Habersham’s 12 local church congregations and volunteers gave 14,528 volunteer hours, provided 3,458 bed nights, and served 10,374 meals. They humbly served 28 children and 17 adults as well as supported 369 families by referral connecting them with additional programs and services. The program’s success rate—families still sustaining independence—has grown to 83 percent. Next Article » Myth’s, Illusions or Truths? HELEN, Ga. – Family Promise of White and Habersham (FPWH) will hold its biggest fundraiser of the year – the 3rd Annual Helen Duck Race — on Oct. 20 during the peak weekend for the Oktoberfest. Family Promise is the only homeless shelter in White County and is an essential resource for homeless children in Habersham and their families. FPWH provides services to both help overcome and prevent homelessness through a strong network of local church congregations and volunteers who provide overnight/weekend shelter, home-cooked meals, and loving fellowship for families who enter the program for an average of three months. 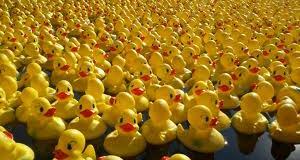 The Duck Race features 2,000 unsinkable little yellow rubber ducks that will be released into the Chattahoochee River across from Paul’s Margarita Deck to race to the finish line at the Helen Festhalle. Sponsors can purchase one duck for $5 or five for $20. The first duck to cross the finish line wins a $1,000 cash prize for its sponsor. Sponsors to not have to be present at the race to claim their prize. If you are interested in purchasing tickets (ducks), please call the Family Promise Day Center at (706) 865-7725. You can also purchase tickets on-site in Helen until 4:00 pm the day of the race. 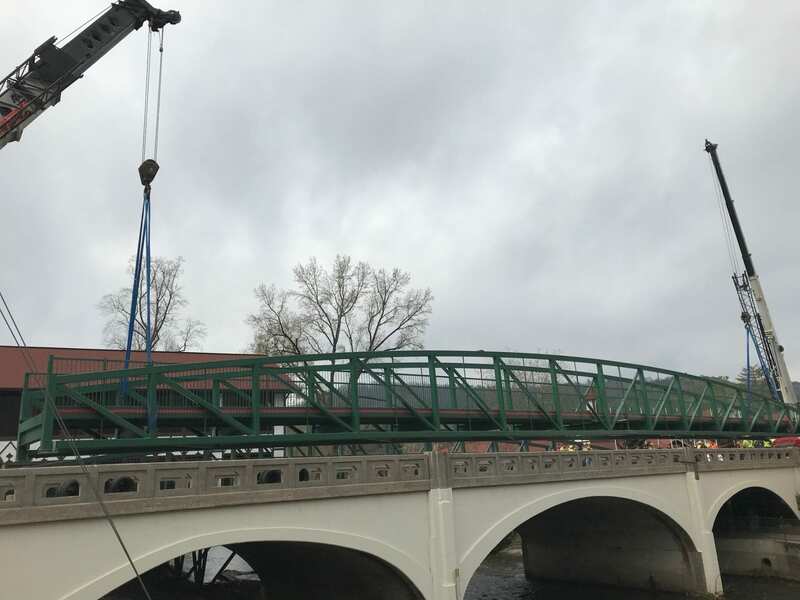 HELEN, Ga. — At 11:20 a.m. Thursday, two massive cranes lifted a 61,300-pound pedestrian bridge high above the Chattahoochee River and swung it precisely into place between International Cafe and The Castle Inn, completing a project seven years in the making. The work had to be precise because crane operators had to lower the massive bridge onto two concrete platforms on each side of the river. The structure with pre-drilled bolt holes in the bridge had to line up precisely with the bolt holes in the platforms. An army of workers from Square Deal Enterprises did an outstanding job of prep work. Once the bridge was secure, the workers drew a well-deserved round of applause from 50 or 60 townspeople and tourists who came out to watch. Opening the bridge to foot traffic is still two to three weeks away. The next step is to pour about 100,000 pounds of concrete for the walking surface and allow it to set. However, Mayor Jeff Ash said he expects to have it open before tourist season begins. The bridge is 157 feet in length, with a total width of nine feet and walking width of 7.5 feet. It is a twin span to the one directly across Main Street in front of Paul’s Steakhouse. Helen Police began to detour traffic away from Main Street (Ga. 17/75) at approximately 8 a.m.